Frisco has several small neighborhoods tucked in corners of it's historic street grid. These and the graph-paper drawn streets on the north and south side of Main Street are Frisco's in-town subdivisions, and together they create a town that offers walkability, is bike friendly and has a border with the national forest. Main Street developed in the 1880s south of the train tracks - now gone - which had been established near the south bank of Tenmile Creek. That creek runs essentially west to northeast across Frisco and the town's other historically-named streets run parallel with it - one north of Main, and a couple south of it. The perpendicular grid goes from 1st to 7th Avenue - west to east. Homes for sale on the grid will be found by searching the town of Frisco sub, but there are many more subdivisions that exist within Frisco proper. Please feel free to contact us if you have any questions, or read more about Frisco's in town neighborhoods. On Main Street, the second floor of many of Frisco's newer buildings may very well contain condos or townhomes. This are usually called by the building name. For example: Scattered Pines Condo, Marina Park Condo, Castlewood, Gateway, Frisco Trading Co. Condo, Frisco Marketplace Condos, Frisco Lodge & Condo, Olde Main Street Condo, Frisco Main Street Commons. Only a few log cabins remain in Frisco, and some of those were relocated from the old town of Dillon, just before the dam was filled. Likewise, there are just a few dozen vacation-home style homes from the early 20th Century, and just a very few A-frames. After the development of ski resorts in the county, Frisco's central location made it a great spot for full-time locals who worked in the ski business to live. In the 60s, 70s and 80s suburban ranch style homes were built, mostly custom built, in the intown subdivision. 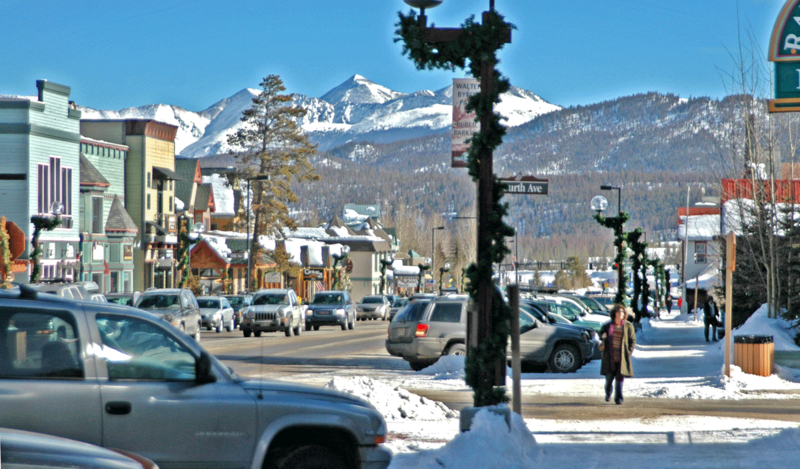 From the mid 1970 through 2000, more full-time residents lived in Frisco than Breckenridge. 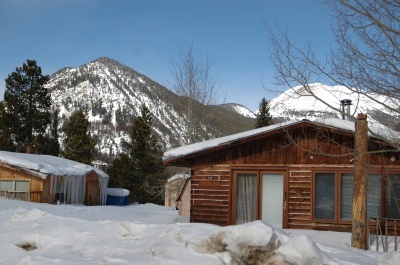 During this time, a few condos or 79s-style multi-family buildings were build and there is sometimes a jarring mix of condos or townhomes next to an historic cabin. Infill is currently blurring the contrast. Starting in the 1990, across the county, cluster homes were the trend and Frisco has it clumps of two-story homes with street-facing garage and driveway. North: A few small neighborhoods of single-family and duplex homes developed on the northside of Main in the meanders of Tenmile Creek, like 5th Avenue Landing, Fourth Estates and River Pines. Walking from these homes to Main Street with skis on your shoulder is easy, and once there you'll find the route of the free county-wide bus system. Across the creek and up on the bluff is the Frisco Duck Sub. So too is Frisco Heights, which not officially incorporated into the town. The creek crossing is on more even grade on the west side of Frisco, and so neighborhoods like Frisco Park and Village are just a bridge and a few blocks away. South: Granite, Teller, Frisco and Pitkin streets are scattered with homes from every era of Frisco's history, and each block has its own character. As you walk south on any of the numbered avenues you'll have to climb a hill - a short one up 5th Avenue to Pitkin street where you'll find the Mountainside area, the new 'affordable housing' or Peak One Neighborhood, the small Frisco Preserve and a few others. Townhome: Grand Cirque Village, South End Village, Tuso Triplex, Pitkin Townhomes, Frisco Peaks, Shadow Woods Townhomes, Teller Townhouses, Frisco Townhomes, Granite Courtyard Townhomes, Aspen Square Townhomes, Frisco 8 Townhomes, Mason Glen Luxury Towne Homes, Teller Crossing Townhomes, Bethel Townhomes, Pitkin Pines Townhomes, Frisco Place, Spruce Point Townhomes. Condo: Watertower Place, Cobblestone Condo, Bears Den Condo, Mount Royal Chalet Condos, Boulevard Bend, Mount Royal Condos, Little Horn Condos, Condos Off-Main, Peak One Condos, Tenmile Creek Condos, Cornerstone, Riverview Court, Mount Victoria Lodge Condos, Lark Mountain Inn, Cedar Lodge Condos, Magnum Condo, Peak One Condos, Ore House Condos. Adjacent to Bills Ranch are Ophir Mountain Village Condos, and affordable housing project, and along Hwy 9 are the Frisco Bay Homes. Across Summit Boulevard (Hwy 9) are the newer, townhomes called Water Dance and the duplex and single family subdivision called Wooden Canoe at Water Dance. North on the Heights: The biggest neighborhoods on Frisco Heights are the Reserve at Frisco and Frisco Heights (unincorporated). The Frisco Duck is a similarly high-end subdivision but smaller than the Reserve. Between those three is the mixed use neighborhood called Meadow Creek. This general area includes single-family and duplex homes, but also Alpine Lake Townhomes, Sans-Traps, Meadow View Townhomes and Condos, Senate Condos, Woodcrest and Sunlight Townhomes. East: Lake Dillon is the eastern boundary of Frisco. On the east side of Summit Boulevard, with quick access to the lake and the paved path through the wetlands are some of the newest housing developments in Frisco and include: Villas at Prospect Point, Prospect Point Townhomes, Raintree, Pointe at Lake Dillon BAy Club at Frisco, Mountain Meadows Condo, Timberline Cove Condos, Towers at Lakepoint Condos, Swing Crew Estates, Whitecaps Townhomes, Lakepoint (a few of each: sfhomes, townhomes duplexes and condos), commercial and residential Drake Landing, Tarn Landing, Meadow Creek Villa Condos, Lagoon Town Homes.